A motion of no-confidence against Michael Spence and senior management was passed unanimously. 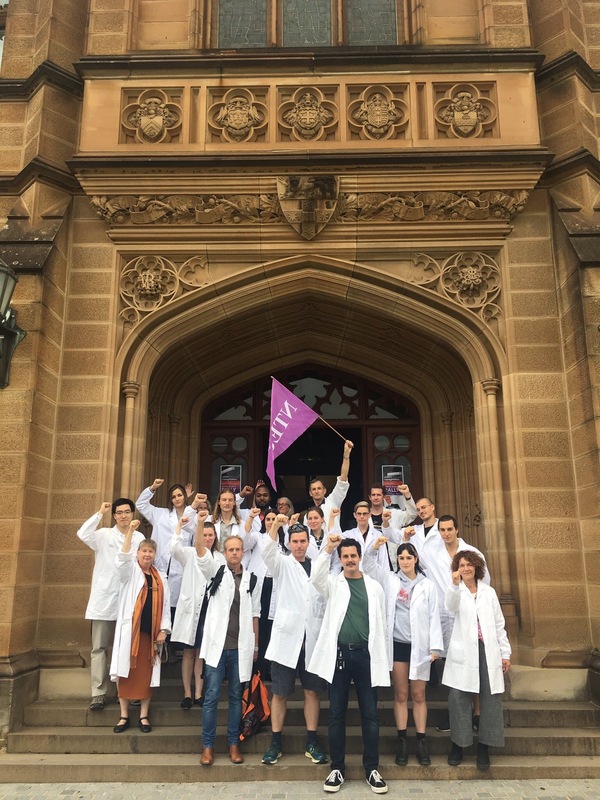 At least 200 staff and students gathered outside Fisher Library this Wednesday for the National Tertiary Education Union’s (NTEU) ‘Unlearn Managerialism’ rally. 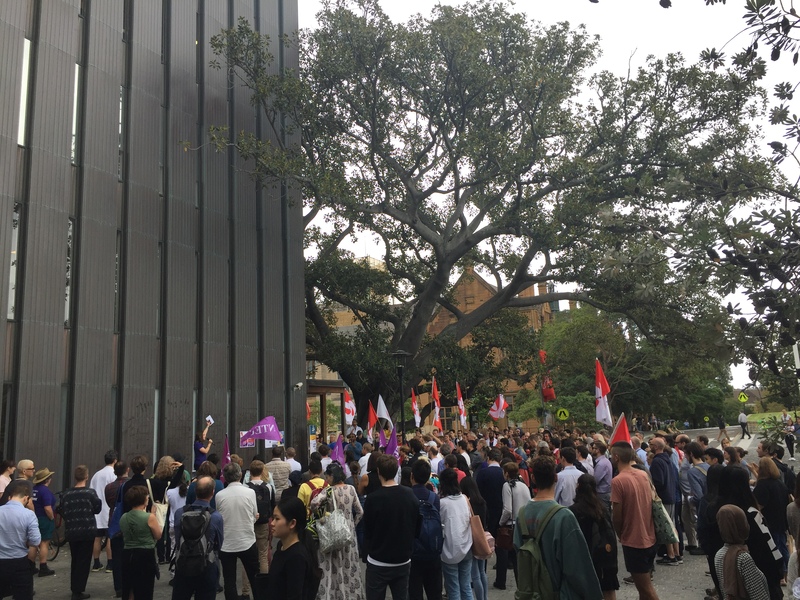 The rally was held in solidarity with those affected by attacks on staff working conditions, and against an ethos of authoritarianism and managerialism coming from University of Sydney management. The rally was organised largely in opposition to the implementation of the ‘Strategic Plan’ — an initiative for university-wide restructuring and corporatisation currently being undertaken by the Vice-Chancellor and University Senate. The plan, outlined in a 63-page report uploaded to the University website begins by outlining a “strategic planning” and “consultation” process with an emphasis on staff and student engagement. However, many at the rally reflected a common experience of the paternalistic attitude University management have taken in the implementation of these changes, repeatedly ignoring the grievances of staff who were most affected by them. Staff and students meet outside Fisher Library for the beginning of the protest. Photo: Liam Thorne. The rally began outside Fisher Library, where attendees were treated to notable addresses, including from Branch Secretary of the Community and Public Sector Union Alexander Yap and NTEU National President Alison Barnes. Among other things, Yap drew the crowd’s attention to a poorly designed “service improvement” to the Student Help Desk, which has increased average waiting times from five to 15 minutes. He claimed that this was symptomatic of senior management’s lack of accountability and their unwillingness to engage with the lived experience of staff dealing with the consequences of managerial blunders. 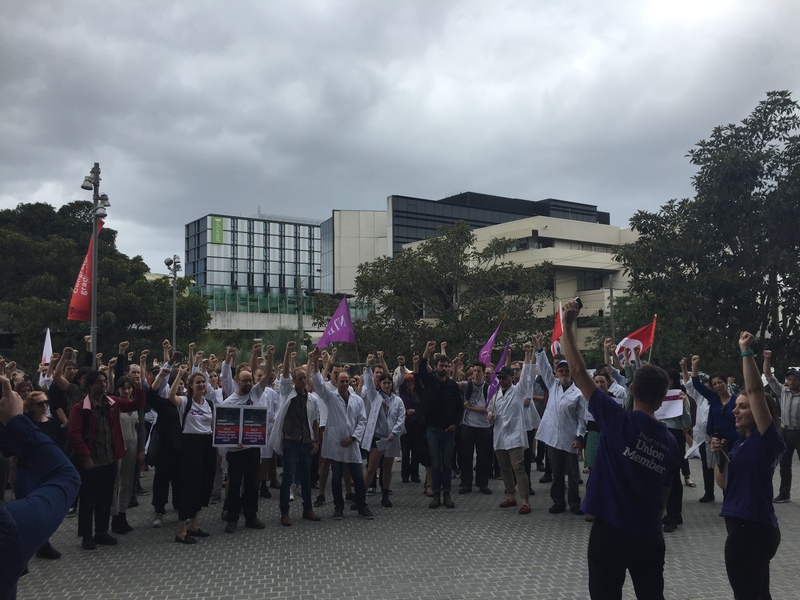 Amidst raucous union chants, the rally headed over to the Anderson Stuart building, where attendees heard from students and members of the Medical faculty currently being evicted from the building under dubious Work Health and Safety pretences. It was here where Aaron Camp, a senior lecturer in Physiology, drew attention to the harassment, intimidation and bullying that management had inflicted on those dissenting against their summary expulsion, which had led to self-medication and even the contemplation of self-harm among staff. Staff from the Medical Faculty on the steps of the Anderson Stuart Building. Photo: NTEU New South Wales Facebook page. An NTEU motion of no confidence against Michael Spence and senior management passed unanimously. Photo: Liam Thorne. Ultimately, it remains to be seen whether management will accept the need for a consultative approach to change, or if they will continue with their approach of top-down, managerial paternalism. This article was amended 29/3/19 to better reflect how interactions between Anderson Stuart staff and management have proceeded.